Allegany State Park in Cattaraugus County, Southwestern NY, covers 65,000 acres of largely forested upland, an area unique in the State for having been ice-free during the Pleistocene glaciation. 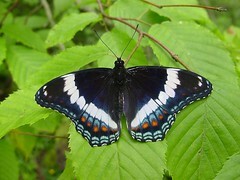 Extensive studies were conducted in 1920s and 30s on its fauna and flora, including butterflies (Saunders, A. A., 1932, N. Y. State Museum Handbook 13:1-270). 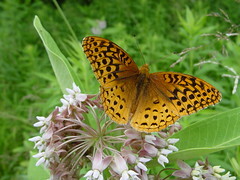 Over the last 70 years, however, the Park underwent substantial changes in the land use patterns, forest compositions and other environmental conditions, yet few studies document corresponding changes in the fauna and flora, with a notable exception of the avifauna in a section of the Park (Baird, T. H., 1990). We report here preliminary results of an on-going survey initiated in 2001 to create a database on the Park’s butterfly fauna and to assess possible changes since the last survey. Several species recognized earlier have been split or lumped in the meantime, and the status of univoltine spring species remained undocumented because the earlier survey was conducted only in summer. 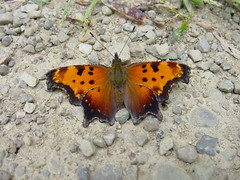 Nonetheless, Saunders’ record included 52 species as residents in the Park. Thus far, our provisional list contains 58 resident species, including 14 not recorded by Saunders. Of these, 6 occur in the spring, 3 were unrecognized in his days, and 3 had expanded their ranges in the Northeast only in the last few decades. 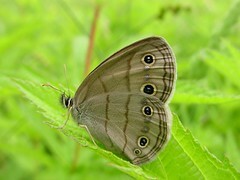 Eight of Saunders’ resident species, including 3 species described as “common”, are yet to be confirmed. These data indicate changing species compositions accompanied by virtual disappearances of a substantial number of species. This has been presented for the Northeast Natural History Conference VIII (May 19-22, 2004) and the Allegheny Biodiversity Symposium, (April 5, 2006).